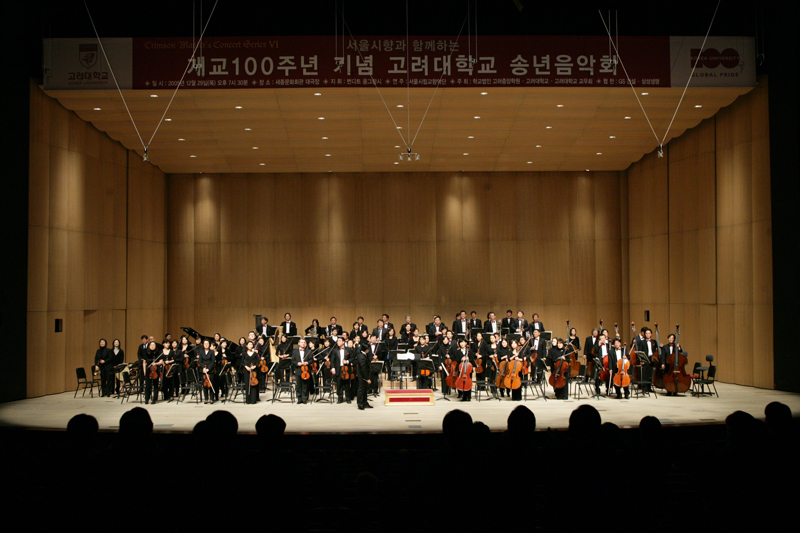 The “Symphony for Freedom, Justice and Truth (also the Symphony for Korea University)” This music was played by the Seoul Philharmonic Orchestra, one of the leading orchestras in Korea, during the Centennial Anniversary Year-end Music Concert of Korea University (Sejong Center for the Performing Arts, December 28, 2005) and the Concert in Celebration of the College of Engineering’s Vision Declaration (Sejong Center for the Performing Arts, October 27, 2006). 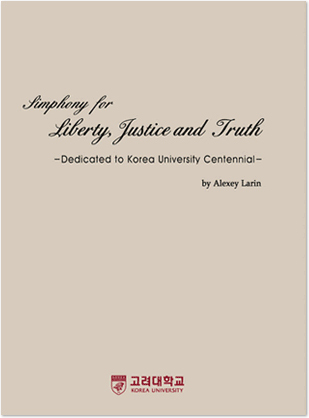 Symphony for Freedom, Justice and Truth was specially commissioned to mark the centennial of the foundation of Korea University. The music symbolizes the KU spirit that inherited the traditional spirit and emotions of the Korean people as well as the nation’s 5,000-year-long history and traditions and evolved them into today’s culture. In addition, the symphony evokes the very nature of the KU community, striding through the globalized era of our time on the strength of the identity of our nation. It is also an enthusiastic dedication and anthem for the KU community. Alexey Larin, the composer of the Symphony, is Professor of Russian Gnesins' Academy of Music and a member of the Union of Composers of Russia. Known as a prominent composer leading Russian music circles, Professor Larin won several composition contests in Russia as well as in Germany and the Czech Republic. It took two years for him to complete it. In the Symphony, Professor Larin skillfully harmonizes the simple, familiar Korean melody and the majestic musical scale of post-romanticism, adding conventional elements of Korean folk music to Russia’s rich symphonic music tradition and his own personal experience. The Symphony, consisting of four movements following the traditional symphonic format, portrays the past, present and future of the Korean people and KU throughout the whole piece. Alongside the music, Korea’s traditional pentatonic scale, unique sounds of traditional instruments, and the cheering and school songs of the KU community play an important part. The music begins with brass instruments in ensemble in the introduction. The richness of the tone depicts a profound, solemn image with the light of dawn breaking through the horizon. Then, the following two themes are filled with the traditional emotions and excitement unique to Korean folk music. The first theme floats in a fluid, round tune over fully lively and elastic rhythms based on the pentatonic scale. It sounds simple yet exciting, refreshing and pleasant. The second theme is much slower and calmer. 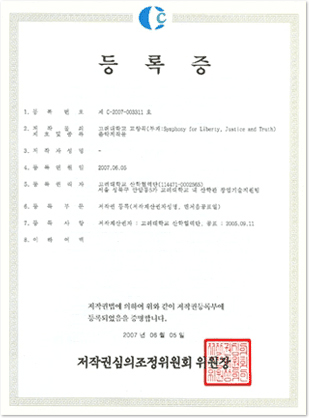 The peaceful, yearning and even sorrowful melody also seems to resonate with bitter sadness, an emotion unique to the Korean people. The development section plays out the recollection of Korea’s historic events. The heavy, dark and contending pitches evoke memories of the tumultuous struggles in Korea history amid a number of aggressive acts by foreign powers and civil conflicts, highlighting the spirit of perseverance and resilience that created Korea’s unique culture and maintains national pride. The movement comes to an end in a calm but hopeful atmosphere, served with the initial tune in the introduction. A powerful drum sound echoes downward. A bassoon solo ensues, making a mysterious sound as if Daegeum (large transverse bamboo flute) and pipe were combined, and the flute solo is reminiscent of the sound of Danso (short bamboo flute). At the same time, string instruments mimic the voices of Gayageum (Korean harp) and Geomungo (Korean zither), and percussion instruments resonate like Pyeongyeong or Pyeonjong (Korean carillon). As such, the andante melody flowing through the movement depicts the image linked to traditional Korean instruments, while the lyric tune is imprinted deep in the hearts of the audience. The music sings of the discourse between the past and the present and the interactions between traditional Korean and western cultures. The movement depicts the KU community as leaders of traditional Korean culture. The melody portrays the highly-spirited and dynamic Daedong Festival, which decorates the field of Anam with a colorful and joyous mood. The traditional folk music is modulated to cheerful songs and high-pitched roars of the public, and the brass band spices up the atmosphere. At the center lies the melody of the famous cheering song, famously known as the Song in Praise of Makgeolli’ within the KU community. This movement starts with the recollection of the previous movements, reminiscent of Beethoven Symphony 9, the Choral. In other words, it symbolizes the progression from the past to the present. The subject section evolves into a strong melody under the theme of the school song of Korea University. The rhythm flows in the style of a march for a while, and then reaching a climax, it transforms into pop and jazz rhythms and melodies, depicting a high-pitched passionate festival scene. However, throughout these shifts, the traditional pentatonic scale of Korea is set as the major chords, the movement thereby capturing the spirit of the KU community marching onto the global stage with Korean tradition cherished in their hearts. The coda depicts the dignified feature of the KU community united in the declaration that they will prevail to achieve victory and glory in the end. -Has composed two orchestral vocal pieces, two vocal symphonies, one oratorio, six cantatas, two choir symphonies, one ensemble music of woodwind instruments, 13 cinema music pieces, and chamber music.